Advanced lawncare is not like advanced mathematics. Advanced lawncare is probably a misnomer but it was the only thing I could think of to describe some of the topics that really didn't fit into basic lawn care. 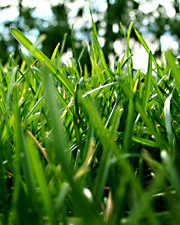 Basic lawn care covers, well, the basics: fertilization, mowing, watering, and weed control. Everything someone might need to know to get started caring for their own lawn. However, a lot of people want to go to the next level in lawncare. We've therefore grouped some of those topics in this category. However, it's not a requirement that you know and understand all of the basic lawn care topics before proceeding to these topics. Probably the most important area to be discussed in this section is thatch buildup and aeration. They are both related to each other. Thatch is a common problem that causes lots of other problems from poor lawn growth, blocking water absorption and nutrient uptake by the grass. Excess thatch also harbors many of the common lawn diseases and insects. We've therefore developed a lot of space describing thatch, treating thatch buildup through aeration, and for extreme cases, we've covered dethatching procedures. There are a few insects that can cause serious lawn damage. However, most insects are beneficial to the health and balance of our entire eco-system. Care must be taken whenever using pesticides to ensure that you don't cause harm to all the beneficial bugs we find in our backyard. The very last thing you want to do is apply an insecticide haphazardly. Sterilizing the entire soil structure can have catastrophic results to the health of your soil. Probably one of the most difficult aspects of having a healthy lawn, is when it is attacked by a disease. Not only are diseases hard to correctly identify, but once they are identified, the damage is already done and there's not much that can be done by a homeowner. The best cure for a sick lawn is prevention. Following good maintenance practices by proper fertilization at the right time, reducing thatch, watering properly and using good mowing techniques, go a long way in preventing lawn diseases from becoming a problem.